For those looking for good bargains here in Cebu, better be at SM City Cebu next weekend for surely you’ll get great finds at affordable prices for they will be having a 3 day sale. If your planning to buy clothes, shoes, appliances, toys, gadgets, household items, furniture and more, better grab this opportunity and head to SM Cebu come March 15 to 17. The SM Cebu Sale will be on March 15, 16, and 17. This is great for this is considered as a pay day weekend sale. Prices will be lowered and select items can be marked down for as low as 70% off. Aside from the SM Department Store, other stores inside the mall are also expected to offer their products at discounted prices. Purchases can also lead to raffle tickets with prices like a 50 inches Devant Smart 3D internet TV . SM Advantage Card holders can also get more discounts during the first 2 hours on the first day of the SM Cebu Sale so better not forget to bring you SM Advantage cards with you come this weekend. March 17: General Luna Band performs at the Event Center at 4 PM. So better be present come March 15, 16 and 17 at the SM Cebu for surely there will be a lot of affordable bargains,live entertainment and great surprises for every one. 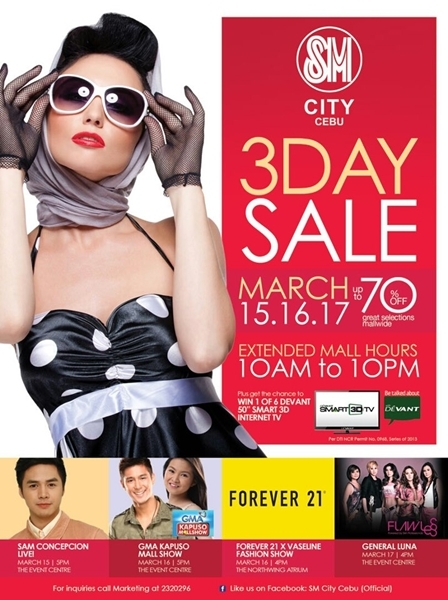 Mall hours are also extended for these 3-days mall sale to accommodate your shopping spree. SM Cebu will be open from 10 AM until 10 PM. For more interesting Cebu News, Events, Food and Travel Tips, please Like the We LOVE Cebu Official Facebook Page.